This sequin business is a PITA, and I mean it. Every single strand of sequins and beads is attached by a chain stitch, so I need to be super careful about how much I pull on a thread to eliminate the pretty things prior to stitching the seams or I end up eliminating too many and will have to put on inches of replacement pieces. Here’s the seam allowances for one sleeve prior to stitching it. And here’s a closeup of a shoulder seam after stitching, but before adding back the pieces that are missing. Messy business. And here’s a picture of one of the darts after my final ministrations of re-attaching the missing beads. 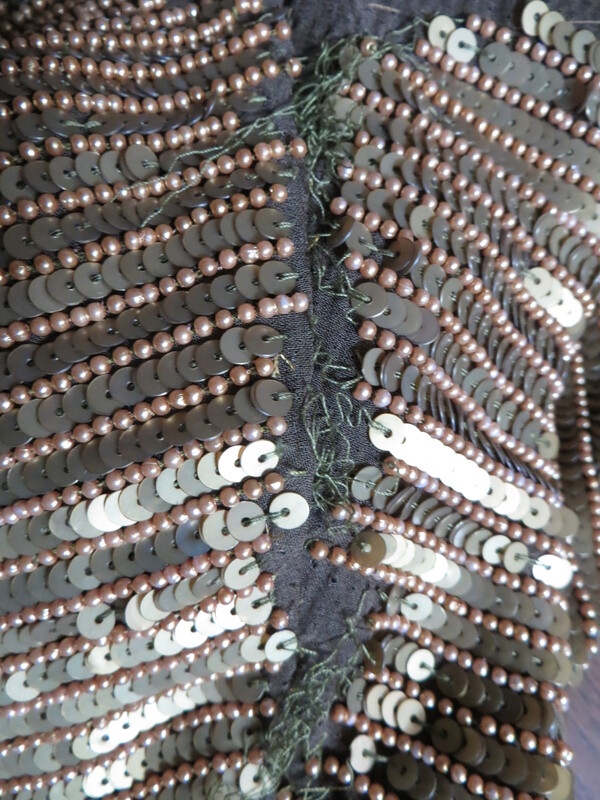 It was near impossible to make the lines of beads and sequins line up perfectly. I’m not exactly happy with this, but what the heck. This shirt is a learning experience and an experiment all rolled into one. And then, of course, after having fitted the toile to perfection, the beaded silk hangs differently, so I’m re-fitting as I go. This has got to be one of the fussiest projects ever. I hope I wear this. Next > Me-Made-May is here! 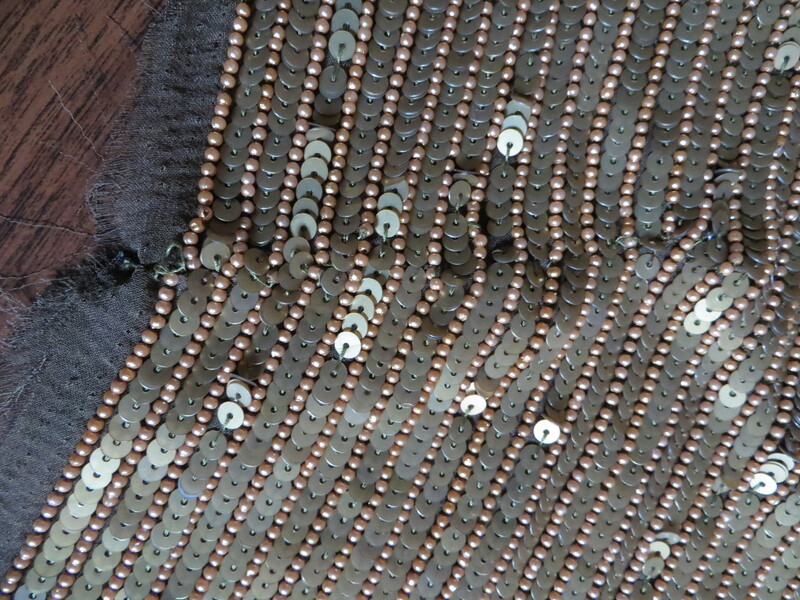 cannot wait to see this finished – you deserve a medal for your patience with the beads & sequins. Tia Dia it is lovely fabric and will be beautiful when its done. I know I would never get past the first dart! Who am I kidding I wouldn’t get past the cutting out the first piece ;). I can’t wait to see it. You must have mountains of patience and persistence! It already looks beautiful. Oh! If I didn´t know about your patience and search for perfection, I would advise you to quit, this is too much trouble. But I know you will dazzle us all in your sequinned shirt. I´m just waiting here! I feel your pain and frustration…tempted to just stop and give up? It looks so good in the photos and you have been able to match up the dart lines so well!!!! Just think it is for you and not for some flighty client who has no idea of the labor involved. Stay with it!!!! Woah!! That is so much work, and such small, hand picking work! I hope that it comes out fatanbulous in the end! wow that is an amazing amount of trouble. 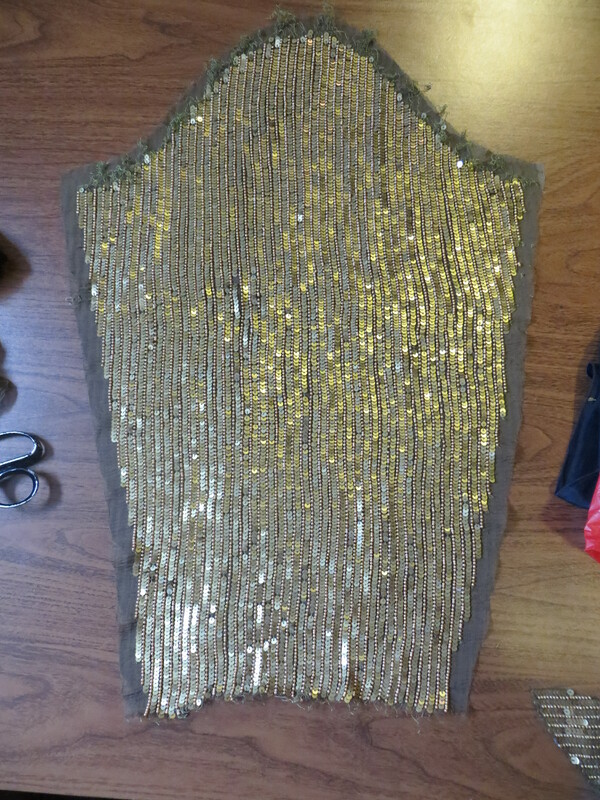 I wonder why the fabric mill chose that method to attach the sequins? It is going to be beautiful when you’re done!